The Low-Down: Have Investors Been Thinking All Wrong About Dropbox? Have Investors Been Thinking All Wrong About Dropbox? One thing the public learned from Dropbox Inc.'s initial public offering document: The software company has impressive financials with relatively swift revenue growth and solid cash flow. But there's also a confusing, potentially less-flattering revelation about Dropbox: We may be thinking about the company all wrong. The big question for a couple of years about Dropbox has been whether it might have to take a step down as it starts life as a public company. We know now the answer is most likely yes. Box Inc., whose core feature is also digital file cabinet software, has a market value about five times Wall Street's forecast for revenue in its year ending January 2019. If Dropbox's revenue this year increases at the same pace as 2017 2 , and it is valued similarly to Box, its valuation would come in at about $7.5 billion. But the truth is Dropbox doesn't have a natural peer. 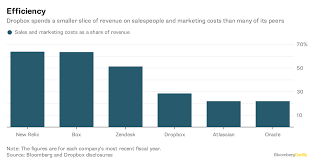 Dropbox doesn't fit exactly with the investor-friendly category of firms that sell subscription software to businesses, including Box or the richly valued Atlassian Corp. We may have put Dropbox in the wrong ... um ... box of companies. It's a consumer software company with a side gig of software sales to businesses. And that makes it tough to know exactly how to value Dropbox. Here's what I mean: Dropbox disclosed in its IPO document that more 90 percent of its revenue comes from individuals who buy the software through its website or app. Those people might use Dropbox for their jobs -- and the company says half of its paying users do so -- but they're opting for Dropbox on their own. This distinction between software sold to people and those sold to companies is important. Businesses, especially the huge ones, are considered ideal customers for software companies. Sure, they are picky and bureaucratic, and that makes it tough to sell them telephone service, janitorial equipment or software. But businesses have money, they are willing to pay for technology that gives them an edge, and once they have technology in place they tend to be resistant to ditching it. Many software companies think the ideal customers are the biggest companies. You can tell that because many software firms that started selling to employees within companies or to smaller businesses have sought to move up the food chain to sell companywide software deals or to target larger companies. Amazon.com Inc.'s AWS, Salesforce.com Inc. and Zendesk Inc. fit this mold. Investors know how to value companies that sell software to businesses. It's not clear they know how to value a company like Dropbox that sells subscriptions to people pulling out their credit cards and tries to get them to persuade their colleagues or employers to pay up, too. Mind you, there are advantages to this approach. Unlike Box, Dropbox doesn't spend much on salespeople to pitch its software to companies. Dropbox's sales representatives are the people who use the software. Other young software companies including Atlassian, Twilio and GitHub also have similar strategies to use individual employees to spread the gospel to their employers. But those three and other well-regarded young software firms make products used by coders or other technical staff. Those employees have the pull to compel their companies to buy the technology they like. The rest of us don't have the same influence with our bosses. Investors will have to come to reckon with this new breed of software company that's not quite consumer and not quite business. More companies, including Evernote, Slack and SurveyMonkey, fall into this category to some degree. These hybrid consumer-business software firms might turn out to be great companies and solid investments. But we simply don't know because it's a relatively untested business approach. Investors examining Dropbox will have to reckon with that. The way investors typically calculate free cash flow -- operating cash flow minus capital expenditures -- doesn't fully capture the cash Dropbox has remaining after paying all its expenses. That's because the company also leases some of its computing equipment rather than buying it outright. 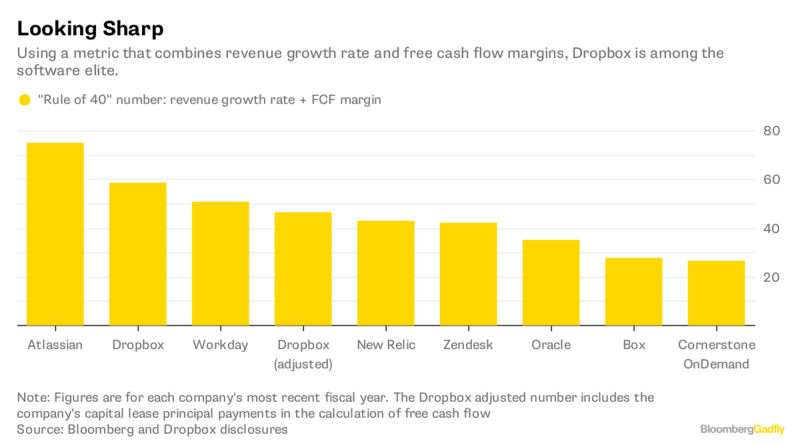 This approach isn't unusual, but it does make Dropbox's free cash flow look better. Counting Dropbox's principal payments for its capital leases, its 2017 free cash flow was $172 million, lower than the reported $305 million. A big chunk of Dropbox's capital lease payments went to Hewlett Packard Enterprise, which is also a Dropbox customer. This is a generous assumption. Dropbox's revenue growth has been slowing.